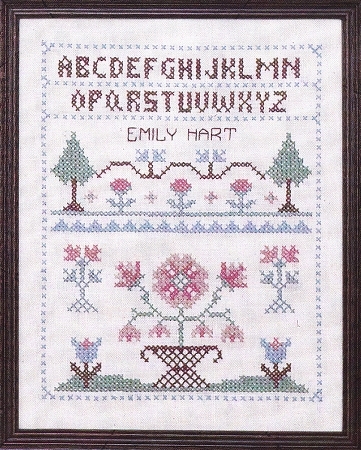 Flower Basket # 347 8 x 10 compliments Monogram Sampler #346 in size and colors, yet it is so different.That is what is unique about both of these cross stitch stamped samplers.Flower Basket has very different motifs,alphabet and trees ,basically the same colors but also an interesting charm that makes both compatible. Both stamped look good on a wall grouping. Haven't had chance to start this one yet. But have finished a number of others from this company and have been very satisfied with every one of them. Appreciate that the orders arrive soon after ordering and that all of the samplers are complete and easy to finish.